A great-grandmother has been found guilty of making hoax calls about a bomb at Cardiff's Motorpoint arena. 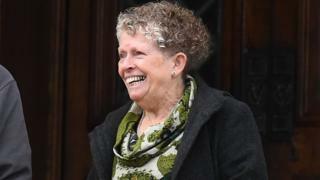 Deidre Murphy, 62, had told Cardiff Crown Court she made the calls to disrupt an arms fair at the venue. Murphy, from Swansea, who represented herself, was found guilty of two counts of communicating false information. She is due to be sentenced on Wednesday. Judge Eleri Rees said the "strength of Ms Murphy's views" on arms sales "does not entitle her to break the law". The judge said there was "very little issue about factual matters in this case" and she asked the jury to consider whether or not Murphy made the call, whether at the time she knew the information was false and whether she knew there was not a bomb at the Motorpoint arena. After the verdict, the judge told jurors it was "an unusual trial, you might think, but as important as any other".